Inspired (and distracted) by overnight comments and ideas from Richard Polt, Erik Jaros and Ted Munk, the Naked Underwood has indeed turned into the Giger Underwood. Thanks for pointing me in this direction, you three visionaries. I was wondering what I would do with it next. I love it, now for a few keytops. There appears to be no middle ground when it comes to opinions about the IBM Selectric-lookalike Remington SR-101 typewriter. Typewriter enthusiasts familiar with the machine are either vehemently in favour of whatever virtues it had or regard the SR-101 with the utmost loathing. Comments from an overwhelming majority of disgruntled users range from a mild "unreliable" to "a nightmare" and "horrible quality" to "the SR-101 fell apart from just being looked at. A most terrible piece of equipment!" One theory has it that the failings of the SR-101 were the result of an IBM "payback". It was claimed Remington had filed a lawsuit against IBM at the time of the launch of the Selectric, in 1961. IBM allegedly settled by agreeing to supply specifications. IBM was said to have "taken their revenge" by delivering altered plans on required materials. "The materials used in the manufacture of the SR- 101 were indeed largely the cause of the machine's many ailments," wrote one critic. 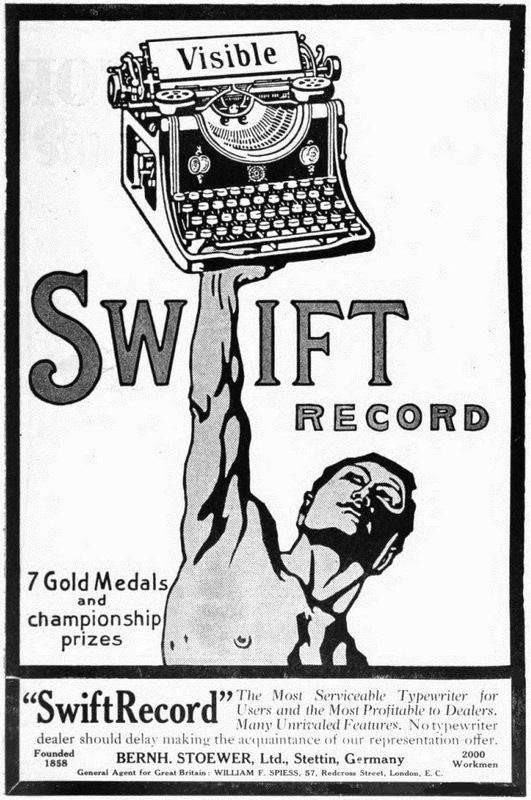 It was one of the last desperate throws of the dice by the one-proud Remington typewriter company. Within six years of the SR-101's launch, Remington was in deep trouble. In 1978, Remington acquired the proprietary technology for producing the SR-101 from Sperry. The next year Remington licensed this technology to its Dutch manufacturing subsidiary, Remington Rand Business Systems BV. The licensing agreement required Remington BV to pay Remington a royalty of about $50 a typewriter for, among other things, the use of the technology. The licensing agreement also contained a confidentiality clause that required Remington BV to treat all information "with reasonable confidence" and to prevent disclosures to third parties. 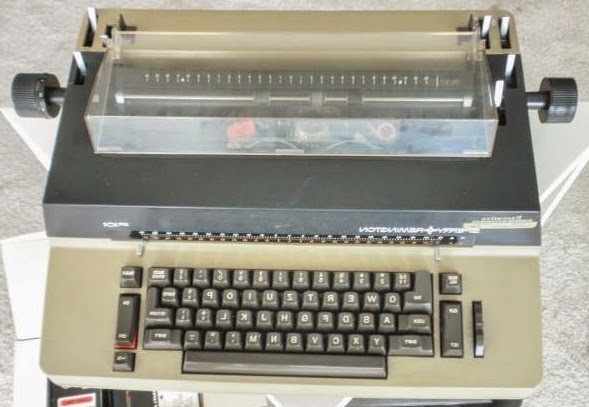 During 1980-81, Remington Rand New Jersey was selling these "electromechanical typewriters" under the Remington Rand logo. 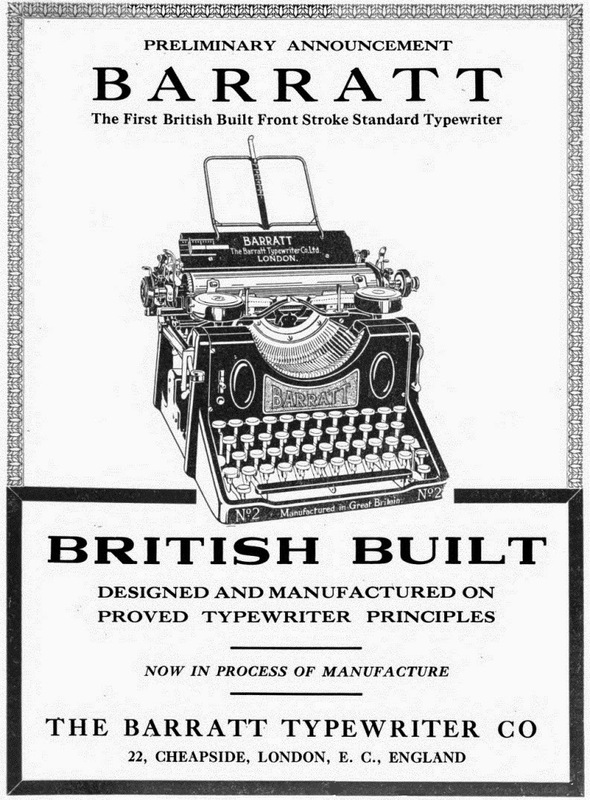 Remington Rand Delaware, as the parent company, collected royalties on the sale and production of the typewriters. The Remington companies also included two wholly-owned subsidiaries: Remington Rand Business Systems BV in DenBosch, Holland, and Remington Systems Italiana SPA in Naples, Italy. All typewriters sold by Remington New Jersey were manufactured at these two sites: the Naples plant produced virtually all typewriters sold in Remington's North American market, while the DenBosch plant produced typewriters for sale in Remington's other markets. Two earthquakes that struck first Irpinia east of Naples, on November 23, 1980 (6.89 on the Richter scale), then Ferentino, north of Naples, on January 10, 1981 (4.4), both seriously damaged the Remington plant in Naples. 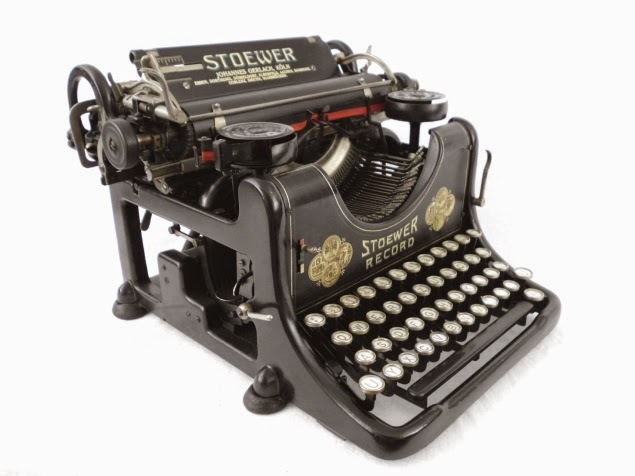 In November typewriter production ceased for five working days. It resumed on December 2, 1980. The second earthquake again stopped operations. Production resumed on February 17, 1981. But on March 25, 1981, the Naples subsidiary was closed as a result of an Italian bankruptcy proceeding that was not related to the earthquakes. As a consequence, Remington lost all control over, and received no more typewriters from, its Italian plant. Almost concurrently, Remington's Holland plant went into bankruptcy and stopped shipping typewriters. Remington's United States companies also filed for bankruptcy. 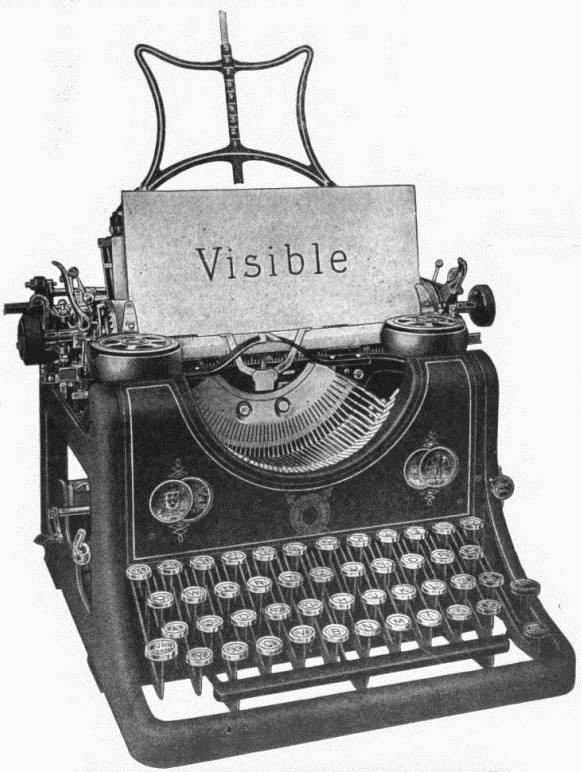 After the bankruptcy of its European subsidiaries, Remington was not able to locate alternative typewriter production facilities. 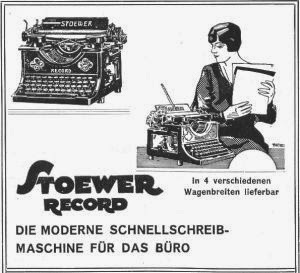 As a result, the company went into a passive marketing mode in an effort to stretch its US inventory of typewriters until it could switch to an alternative product. In November 1980 it held 32,500 typewriters and satisfied its ordinary sales obligations, selling 5400 typewriters. Inventory increased to 34,000 typewriters in December, 35,052 in January and dipped only slightly to 28,334 in February 1981. 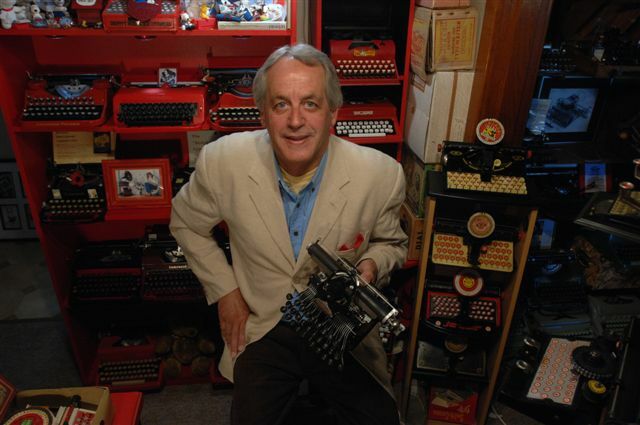 But between March-June 1981, Remington's inventory decreased from 27,364 to 11,814 typewriters. Remington was able to acquire 14,500 typewriters from an outside source (Brother in Japan) between September-November 1981. The company reorganised in December 1981 and changed its focus to the electronic SR-101 typewriter. In 1984, the Remington Rand Corporation (which changed its name that year to the Kilbarr Corporation; it was also later known as the Pennbarr Corporation) took successful court action in New Jersey against Dutch company Business Systems Incorporated International (BSI), and was awarded damages of $221.4 million for misappropriation of trade secrets in relation to the SR-101. The damages comprised $4.95 million for injury to the value of Remington's trademark, $38 million in lost royalty payments and Remington's estimate of almost $178 million lost profits from sales of machines, parts and supplies for the time that it would take Remington to develop an alternate source of supply of electronic typewriters. Remington asserted it would have made $209.67 per machine on sales of 100,000 machines per year for eight years. “(1) it would have needed eight years to find an alternate source of supply [of electronic typewriters]. The litigation focused on the transfer and use of proprietary technology for the production of the SR-101. After the initial finding, BSI went into insolvency, preventing Remington from collecting the judgment. Remington then won a subsequent judgment, awarding it damages of more than $339.4 million, against Amsterdam-Rotterdam Bank and another Dutch bank, Pierson, Heldring & Pierson. Remington asserted that the banks were responsible for BSI's misappropriation of SR-101 trade secrets and were liable for the judgment against BSI by virtue of their complicity in the misappropriation and their control over BSI's defence of the New Jersey litigation. The jury rejected the claim of the banks that they were protected by releases executed by Remington, finding that the releases were fraudulently induced. The district court held the banks liable for the damages previously found in Remington's suit against BSI, barring the banks from contesting the amount of Remington's damages. Interest of $118 million was added to the original judgment, taking the total to $339.4 million. The banks appealed against this judgment in 1994-95, saying the district court erred in failing to give effect to the releases executed in their favour by Remington, and in precluding the banks from contesting the amount of Remington's damages. The court of appeals agreed with the banks. The contracts between Remington and Remington BV provided that Remington BV would manufacture the SR-101 and supply Remington with the typewriters. To provide working capital for this venture, Remington BV obtained loans of $10 million from the banks, secured by liens on Remington BV's assets. Both Remington and Remington BV soon began experiencing financial difficulty. By the end of March 1981, Remington sought bankruptcy protection, while Remington BV had defaulted on its loans and entered "suspension of payments" proceedings in Holland under Dutch insolvency laws. Remington BV was declared bankrupt on May 26, 1981. Its assets, including the technology licensed from Remington, were subsequently sold by the Dutch bankruptcy to BSI, which had been formed by a group of Middle Eastern investors to acquire Remington BV's business, with financing provided in part by the banks. Remington contended that the sale of Remington BV was the result of a conspiracy formed on May 11, 1981, between the banks, the trustees and the investors to misappropriate Remington's typewriter technology. Remington claimed the conspirators plotted to distract it by an insincere proposal to buy Remington's stock while they put Remington BV into bankruptcy and arranged to sell its assets to BSI. With this objective, the trustees sent an ultimatum to Remington on May 12, 1981, demanding that the shares of Remington itself be sold to the investors by May 20, 1981, failing which Remington BV would be forced into bankruptcy on that date. Remington sought to negotiate this demand, but the investors, who never intended to purchase Remington, refused and secretly pursued independent negotiations with the trustees to acquire Remington BV. On May 19, 1981, Remington sent a telex to the trustees and the banks stating its willingness to negotiate a sale of Remington. This forestalled the bankruptcy of Remington BV. Meanwhile, negotiations for the sale of Remington BV continued between the banks, the trustees and the investors. On May 25, 1981, the investors tendered an offer to the trustees. The next day, May 26, 1981, on the petition of the trustees, Remington BV was declared bankrupt. That same day, the trustees asked the Dutch bankruptcy judge overseeing the Remington BV proceedings for permission to conduct a private sale. Remington learned of these developments on May 27 through its Dutch counsel, Allard Voute, who read of the bankruptcy and impending sale in Dutch newspapers. On June 1, 1981, the Dutch bankruptcy judge approved the sale. The Dutch judge's approval was based in part on the trustees' representations that a sale of Remington itself was impossible, because of the licensing agreement. As proof of this, the trustees had submitted the May 12 ultimatum without revealing the existence of Remington's May 19 reply. On June 4, 1981, the trustees sold Remington BV's assets to the newly created BSI. The sale had the effect of transferring and disclosing the SR-101 know-how to BSI. About $8 million, or 90 per cent, of the sale proceeds went to the banks as payment for loans extended to Remington BV. The banks subsequently entered into new loan agreements with BSI. This left Remington without product source. BSI, on the other hand, began efforts to develop a distribution network in the United States, independent of Remington. 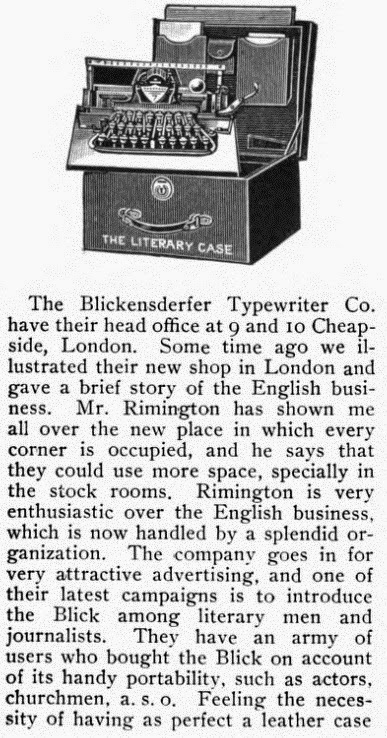 Remington negotiated with BSI to receive BSI's typewriters for sale in the US. In August 1981, after these negotiations failed, Remington filed suit against BSI in the US bankruptcy court for New Jersey. Remington accused BSI of trademark infringement and misappropriation of trade secrets. 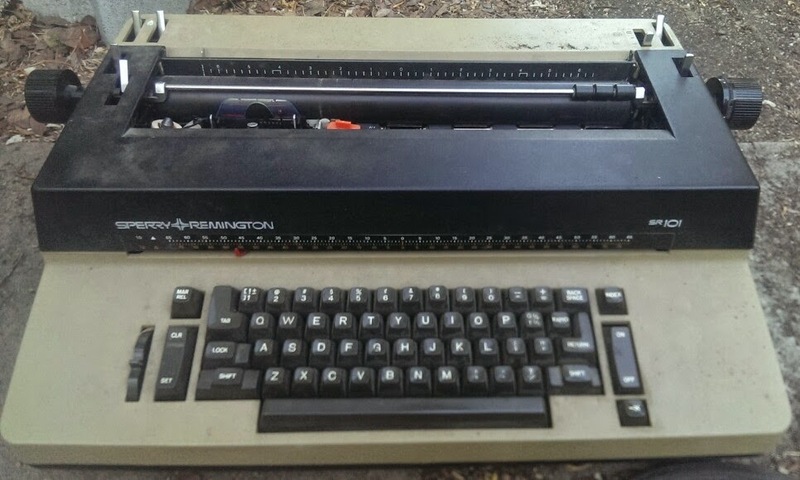 Remington sought a preliminary injunction preventing BSI from selling typewriters in the US. Remington began articulating suspicions about the banks’s involvement in BSI's affairs. In December 1981, Remington asserted is efforts to secure a typewriter supply from Remington BV in April 1981 had been defeated by interference from the investors, with "either the cooperation of or the support of or the trickery and deceit of the Dutch banks". In April 1982, Remington claimed the banks, the investors, and the trustees had worked together to frustrate Remington's efforts to maintain an ongoing relationship with its Dutch subsidiary. In September 1984, the New Jersey district court imposed liability on BSI for using the SR-101 technology without compensating Remington. The court held a separate trial to determine damages. Before the trial, however, BSI entered suspension of payments proceedings in Holland and was declared bankrupt. The trial on damages proceeded in April 1985. Remington then took further action against the banks, in New Jersey and New York, charging them with participation in BSI's misappropriation and continued use of Remington's trade secrets and seeking to hold the banks liable for the judgment Remington had won against BSI. The special verdict contained findings that the banks had conspired with others to acquire and operate Remington BV's business by "fraud, trickery and deceit", and that the banks had fraudulently concealed material facts to induce Remington to sign releases. The jury found that the banks were liable for the damages awarded by the New Jersey court against BSI because they substantially participated in the control of BSI's earlier litigation. 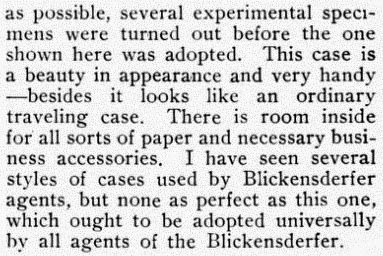 This Blickensderfer typewriter case had suffered some severe water damage on the watch of a previous owner. Blick cases are such beautiful things and I hated seeing it in the terrible state it was in. Every time I look at it, I cringed. Neglect had caused the thin wood veneer to "bubble", break and lift off the core panels. The top sheet of wood veneer had warped completely away from the front section, above the leather handle strap. As well, the panels had seriously buckled in parts. The back of the case and both front edges nearest the handle were the worst affected. Would I do any further damage if I attempted to at least partially restore the case? Well, maybe, but anything would be better than the way it was. As it turned out, the yawning gaps around the edges and elsewhere could be closed, and the wood veneer reapplied to the straightened core panels, with the use of plastic wood and clips. I should have taken a "before" photo, but didn't think about photographing the process until I was more than halfway through it. Once the plastic wood had dried and hardened, I was able to sand it back, apply a smooth surface of matching wood putty, and colour it with wax touch-up crayon and a darkening coat of tan boot polish. Then I rubbed in furniture polish to give the whole surface a consistent look, and sealed it all off with a satin stain spray paint. I also carefully took the deep rust off the clasps and handle grips with a wire brush on an electric drill. So it's back looking pretty presentable, even if the top coat is still drying ... Indeed, compared to what it was like, it now looks absolutely fabulous - these "after" photos don't do it justice. One thing I have been able to do successfully over the years is restore typewriter cases, if not always the machines inside them! Englishman John Frank Batthews Bowden (1871-1951), of the United Typewriter and Supplies Co, helps an "Afghan cameleer", left, (with a boy assistant) to pack a camel load of Densmore, Yost and Caligraph typewriters headed for Coolgardie on the fringe of the Great Victoria Desert in Western Australia during the gold rush of 1898. 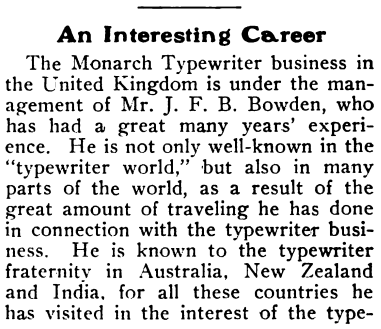 Two weeks ago I posted on the Union Typewriter Trust's thrust into Australia in the mid-1890s, through its international trading wing the United Typewriter and Supply Company. At the time of researching the post, I came across this wonderful image, which I found in the National Library of Australia's Trove digital archives. 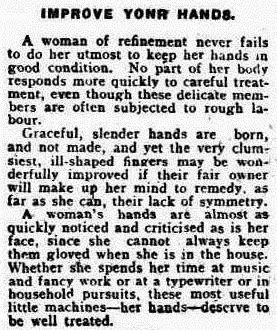 However, the image had been reproduced in Perth's Western Mail newspaper from a copy of the Sydney Bulletin, where it had first appeared on September 24, 1898. The Bulletin has not yet been digitised by Trove. Not surprisingly, given the engraving processes used at the time, Trove's jpg of the Western Mail image was far from clear. 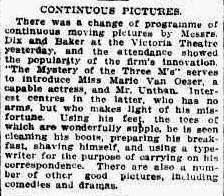 Yesterday my friend Bruce Coe took me to the National Library here in Canberra, found the microfilm of the Bulletin from 1898 and created a PDF of the image, which I have since been able to scan and upload here. I think it's much clearer than the one I used with my UTSC post. 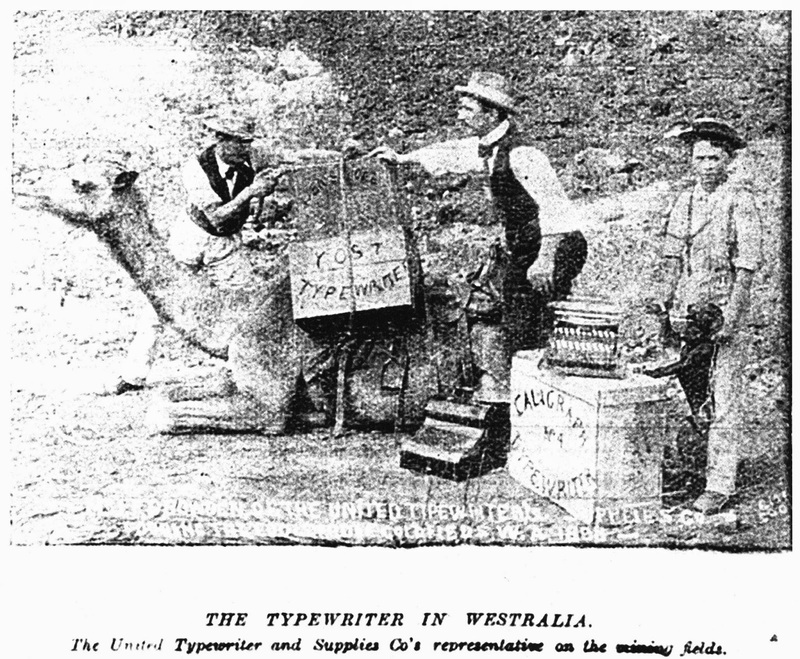 The photograph shows a camel laden with Densmore, Yost and Caligraph No 4 typewriters on the Goldfields of what was at the time referred to as "Westralia" [Western Australia]. 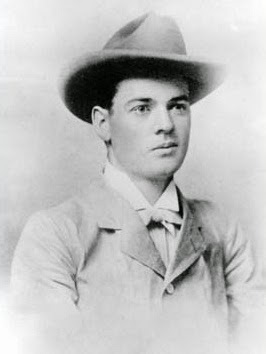 At the time this photo was taken, working of these Goldfields was Herbert Clark Hoover (1874-1964), later to become the 31st President of the United States (1929-1933). 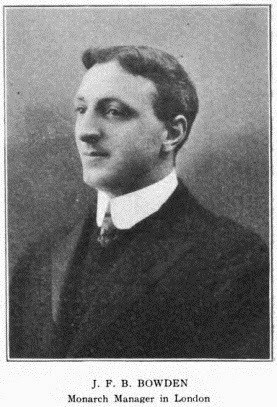 Hoover went to Western Australia in 1897 as an employee of Bewick, Moreing & Co, a London-based gold mining company. 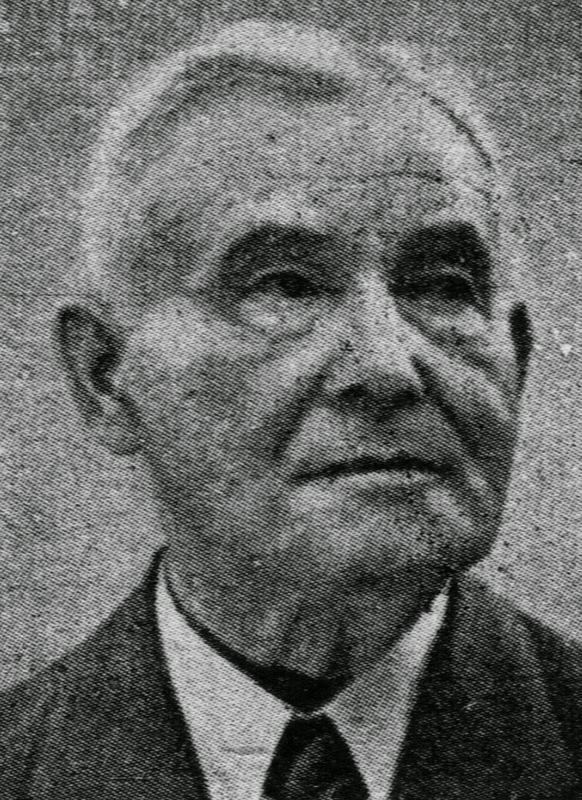 He worked at gold mines in Big Bell, Cue, Leonora, Menzies, and Coolgardie. 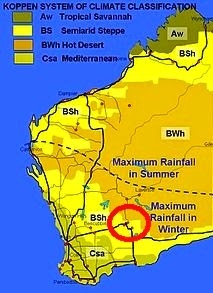 Hoover first went to Coolgardie, then the centre of the WA goldfields. 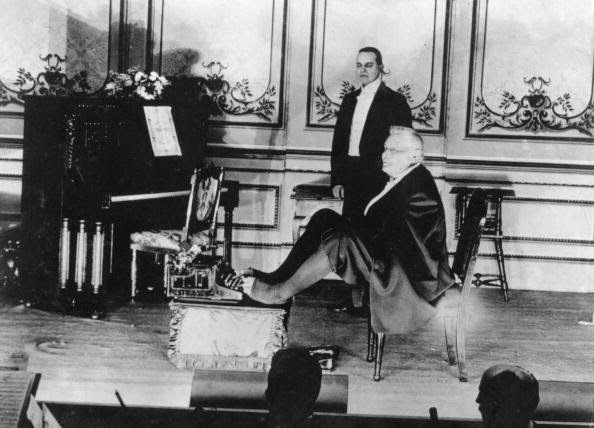 Conditions were harsh but Hoover was paid a $5000 salary (equivalent to $100,000 today). In the Coolgardie and Murchison rangelands on the edge of the Great Victoria Desert, Hoover described the region as a land of "black flies, red dust and white heat". He served as a geologist and mining engineer while searching the goldfields for investments. After being appointed as mine manager at the age of 23, he led a major program of expansion for the Sons of Gwalia gold mine at Gwalia. In my book, BWh stands for "bloody witheringly hot". When Perth experiences a heat wave (and I've been through one), it's when winds blow straight off the desert toward the Indian Ocean. 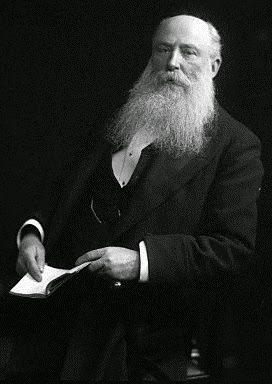 The Australian United Typewriter and Supplies Co network was established by an Englishman Henry Gray Cambridge (1868-1922), who was sent to Australia by Milton Bartholomew (1855-1927), managing director of the trust-controlled Yost Typewriter Company on the Holborn Viaduct in London (where Cambridge had been Bartholomew's assistant). This was also the English headquarters of the United Typewriter and Supplies Co. At the time of setting up the UTSC in London, both Bartholomew and Cambridge worked for one-time London Lord Mayor Sir Sydney Hedley Waterlow (1822-1906), a judge of typewriters at the 1876 Philadelphia Centennial Exhibition. 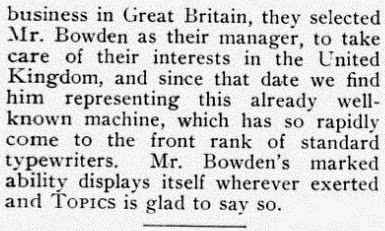 Bartholomew also sent out typewriter expert William Thomas Harding (1870-1912) and Harding's brother-in-law, John Frank Batthews Bowden (1871-1951), who was associated with the Yost, New Century (Caligraph) and Monarch brands in England. 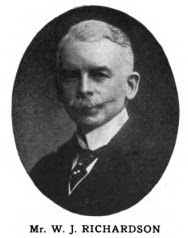 Bowden's movements, from Western Australia to North Queensland and on to New Zealand and then Sri Lanka and India, were all directed by the trust from New York. 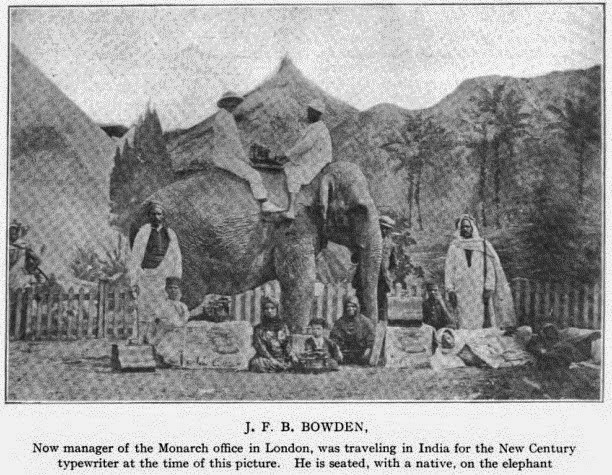 It is Bowden who is in the photograph at the top of this post. 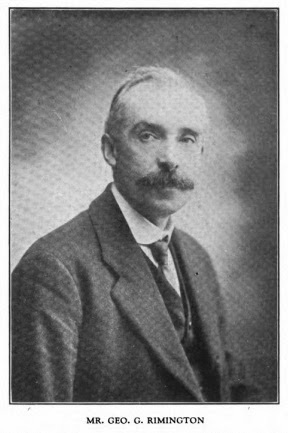 He was born to fine art publisher Felix Joyce Bowden and his wife Elizabeth Emma Batthews in Finsbury Park, north London, on October 5, 1871, and died in Brighton on May 1, 1951, aged 79. He arrived in Sydney on the Oroya on September 4, 1897. 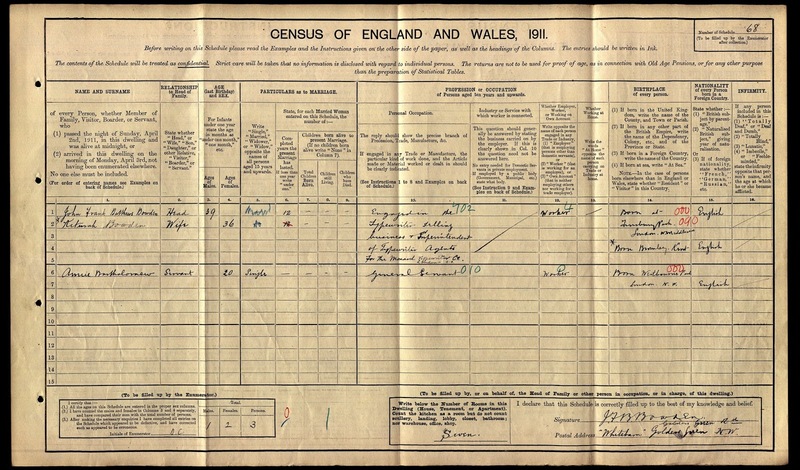 His wife Keturah and three daughters arrived in Fremantle on the Allinga the following March. When the Coolgardie gold rush started in 1894, the "Afghan cameleers" (so-called, although they did not originate in Afghanistan) were quick to move in. The goldfields could not have continued without the food, water and typewriters they transported. In March 1894, a caravan of six Afghans, 47 camels and 11 calves set out across the desert from Marree to the goldfield, with the camels carrying between 135 and 270 kilograms each. Another 57 camels for Coolgardie arrived by ship in Albany in September. By 1898 there were 300 members of the Muslim community in Coolgardie. Coolgardie held the main Muslim community in the colony at that time. Simple mud and tin-roofed mosques were initially constructed in the town.